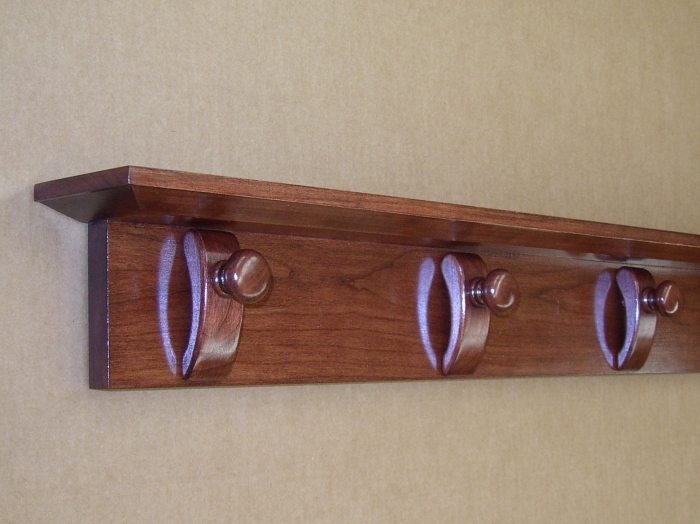 I designed this hanger with individual wood clamps instead of the customary continuous wood pressure bar. 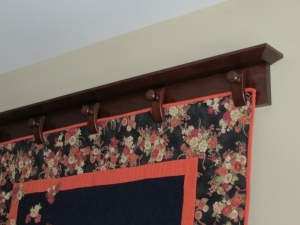 With this design quilts can be mounted on the hanger one clamp at a time while the hanger is on the wall, which is a great benefit with larger quilts. I cut the clamps and turn the knobs from the same wood as the rest of the hanger. 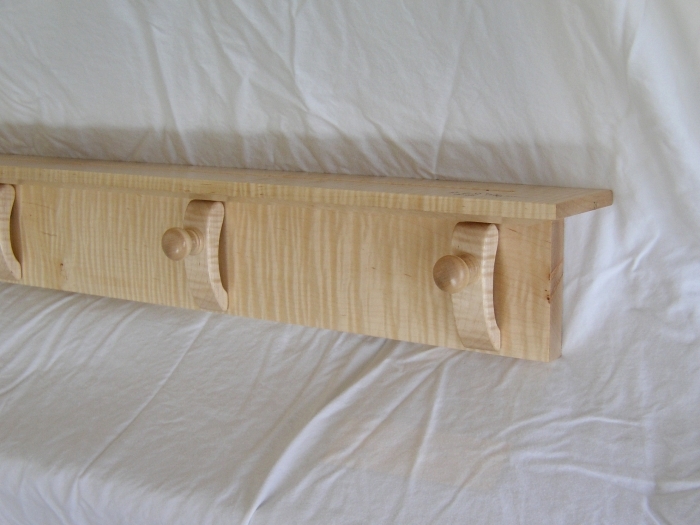 The 3-1/4” wide top shelf includes a plate groove. 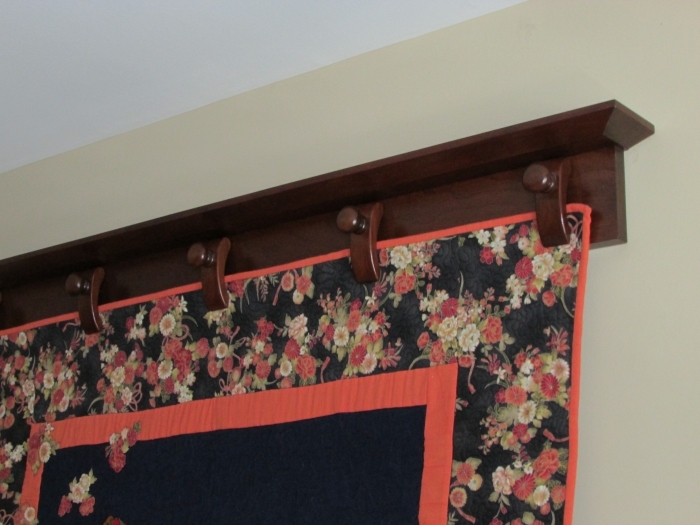 The first hanger was developed with a length of 108” and clamps 6” apart for a professional quilter who hangs completed quilts including king size in order to photograph them. All hangers are made to order to the length specified by the customer, and with clamp spacing agreed in advance. The hangers are priced according to the finished length and various lengths are shown below; for example, a 45" hanger (falling between 36" and 60") would be $100, 64" would be would be $150, and a 90" would be $210. Because of shipping size limitations the longer size hangers (greater than 100") will be shipped in two pieces to avoid excessive commercial freight shipping cost; assembly is easy, and can be done with or without glue. All finishes are of furniture-grade quality; all the pieces are intended to be placed with fine furnishings in the home. As can be seen in the photographs I also make the hangers with a continuous pressure board. 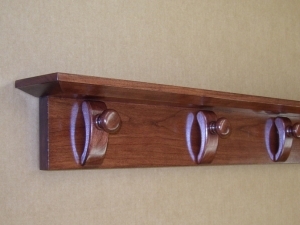 In the Price List below (A) indicates Cherry, Oak and similar grade wood; (B) indicates Walnut Curly Maple and similar premium wood, and is for hangers with individual clamps; for a continuous pressure board add 15% to the price. For this style the actual shipping cost will be slightly higher because of the added weight. Shipping estimates are for points in the eastern US and will be higher for greater distances. THESE PRICES ARE SAMPLES. 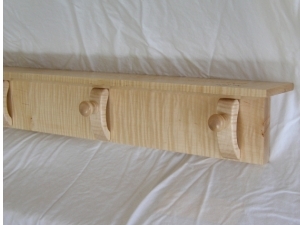 QUILT HANGERS ARE MADE TO THE LENGTH REQUESTED BY THE CUSTOMER. The recent (late 2014-early 2015) UPS fee for shipping a 60" hickory hanger with continuous pressure board (very heavy) to Utah was $50; a 72" hanger with clamps to Brownfield, Texas was $45; and a 90" hanger with clamps to Lubbock, Texas was $50.